Tonight's salad recipe, which is actually quite simple to make, is a traditional salad - a Waldorf Salad, with a couple of twists. I was inspired by a recipe from the Tabla Cookbook, Once Spice Two Spice by Floyd Cardoz , to prepare this recipe. I actually wrote about this salad in my very first post, when I was discussing several recipes from this cookbook, and the concept of American-Indian fusian food. American food really is the combination of all of the different ethnic cooking traditions that make up the American population. Therefore, it is no suprise that I consider American fusian cooking - the combination of so-called American food with ethnic spices and flavors - to be as much a part of the American culinary palette as any "traditional" American food. This is the inspiration behind the restaurant Tabla, and behind Cardoz's cookbook. The main difference between my salad and the one in the cookbook, is simplification. I used the basic ingredients and Indian spices in the salad dressing, but left out a lot of the complications to create a quick and easy waldorf salad recipe that still has the Indian flavorings. 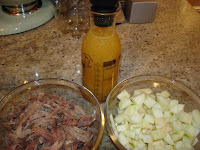 To prepare the dressing, do an orange juice reduction, as Cardoz suggests. Put the ginger, orange juice, star anise and cinnamon in a sauce pan and reduce by boiling to about 1/3 of a cup. Mix with 1/3 cup of canola oil. 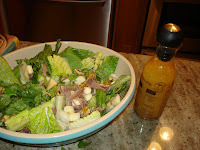 Add the shredded duck confit, apples and walnuts to the lettuce and mix the waldorf salad. Add the dressing and serve. This salad is delicious and has hints of Indian flavors in the dressing that make it more than just a traditional duck confit waldorf salad.